Or – “THE BRAWL TO END IT ALL!!! A Mean Tantrum ’bout de’ Green Lanterns! The Big Dance with the Guardi-ance! The Smash-Face in Deep Space! The Pain Felt in the Asteroid Belt! The Bombardiers in the Upper Atmospheres! The Altercation for the Spectrum Nation! The Big Ol’ Fight with Creatures Of Light! The Grudge-Filled Ruck-os in the Endless Cosmos! The Bellicosity at Escape Velocity! Still, the gambit works, as Kyle is able to create a scene of the multi-hued Lanterns breaking free of the Book, and since everything in the Book of The Black really happens, then… Wait, what? My brain… It hurts. In any case, Atrocitus, Carol, Sinestro, Larfleeze and company (Attorneys At Law?) leap out of the book, and their rings suddenly appear to re-Lanternify them… only to be snatched away at the last second by Krona! The Rogue Guardian uses his seven lady truckers rings of power to crush the life out of Hal, asking him why he would defend the same Guardians who rejected him and his friends. Hal responds by telling him that life is subjective, that our flaws make us who we are, and there’s a weird moment as Sinestro listens in disbelief, then takes up arms to fight alongside his oldest foe. Observant Spoilerites may not be surprised by what happens next, and Hal and Sinestro band together to defeat the Mad Oan, blasting Krona right through the chest. The Guardians of The Universe return to (what generally passes for) their senses, view the carnage, and come to an immediate decision: Hal Jordan is to be stripped of his ring and rank, and exiled back to Earth for the crime of killing a Guardian. Did NOT see that one coming, even after DC’s late announcement, but I have to say that I like it, not because it will knock Hal down a peg, but because it should allow the creators to show us WHY they believe he is the one, true Green Lantern. Those who have said that Green Lantern isn’t going to have any changes in the big September relaunch should probably get some salt, as they’re going to have to eat those word. Still and all, this issue isn’t as strong as I would have liked, with it’s near-maniacal focus on one man in the middle of what is supposed to be a giant intergalactic conflict. Aside from Kyle and Sinestro getting their brief moments, nearly no on else matters in the battle. John and Guy get a handful of lines, while Arisia and Kilowog are pretty much human scenery (albeit of a non-human variety.) There is some (probably intentional) confusion about whether or not the Gruesome Twosome really meant to kill Krona, and the Guardians are once again maddeningly obtuse, but on the whole it’s a strong enough issue. The art is well handled throughout, and the book reads smooth, with a shocking reveal or two. 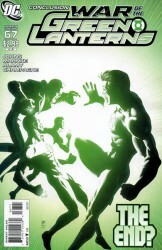 Green Lantern #67 is at least an interesting set of developments, earning 3.5 out of 5 stars overall. With luck, they won’t immediately return to the status quo come September. Faithful Spoilerite Question Of The Day: This issue is full of rainbow combat, and the monsters of the spectrum take center stage, but have we gotten to the saturation point on the emotional spectrum and all the various colorful Lanterns? I wasn’t very satisfied with how Hal was disavowed. Not because Hal won’t be a GL anymore (I prefer Kyle anyway), but because what he did was in the interest of saving the rest of the guardians. I mean, Krona is called “the renegade guardian” for crying’ out loud but killing him is still a GL crime? Hal: Hey guardians. Something is happening and we need to do something to stop it. Dumbtarded Guardian: We’re watching the situation. It’s none of your concern. Humans are so impulsive. Hal: Ok. I saved the universe. Guardians: You are so awesome and cool. But you killed a very powerful and dangerous evil person. You are punished. Guy Gardner: F***ING BLUE GNOMES!!! As usual, the Guardians are hiding something… and feel like Hal is on the cusp of unintentionally tipping their hand. That is all Hal’s ever done. Proved a human can handle the ring. Proved Yellow existed and could be overcome, proved the larger spectrum… on and on… proved to the corps that the guardians have known many things that could have saved their fellow lanterns. In fact the Guardians have never been straight with any of the corps… which makes me think that if Sinestro is back… might the corps follow him this time, if only to get back Hal and unseat the Guardians? I’m talking long term, big picture here. Sinestro went “rouge” because he disagreed/didn’t trust the Guardians. If history repeats its self I feel the Guardians are in a weaker position, since it’s now been proven that the two strongest can take one out (powerful one at that). That’s why they panicked and striped Hal… they see it coming. I think more than anything else they were scared of Hal and that’s why they stripped him of his ring. It’s not so much that he did something wrong as it is that they realized he has the willpower to actually kill a guardian and they fear for their lives. What happened to the entities? This issue is a weak end point to a weak storyline. I believe the term is the no sell. You have a group and powerful as “rainbow coalition” and they can’t beat Krona. Only Hal Jordan that pulky earth man can do it. 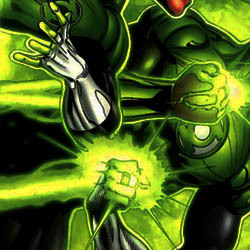 Because humans are so great and super and hal is the bestest green lantern ever! Honestly I was waiting for Barry Allen to show up to help save the day. Great Hal moments and the end speaks of more to come. Greatest GL gets knocked down and we get to see how he deals. I know it’s tough to put stock into solicitations and covers, but I’m going to do it anyway. Clearly the solicitation for issue #1 and the cover for issue #2 show they aren’t immediately returning to the status quo. Done with the rings of many colours. I went out of my way to collect all the green lantern stories way back when Hal Jordan returned in ‘Re-birth’ and I intended to keep reading it but soon as I found out they were rebooting the DCU (Again, I mean again, you know after again….) and that all this wouldn’t matter in the end I stopped buying the comics. It’s a shame because I was growing dissatisfied with Marvel’s event fatigue and was just about to switch flagships to DC but I am not interested in re-introducing the entire DC universe and having zero continuity. There is some continuity. Green lantern continues after this issue in GL#1… as does batman. Certain things still happened, I believe it’s just over a way shorter time frame than the 75 years DC has been around. On the newest JLI #1 solicit they have “Green Lantern” and “Hal Jordan” listed as separate entities, (and Guy Gardner is the GL on the cover) so I am thinking this means Hal Jordan is going to bum around like the Steve Rogers of the DCnU. I guess he can fly the JLI’s plane? Well if Hal is not a Green Lantern anymore then how is he part of the Justice League as a Green Lantern? All of this is too confusing to make any sense with this reboot. And it is a reboot. According to D.D. at DC, the JLA book will be set “in the past” rather than currently, just as Action Comics will be. And it is a reboot. Calling it a reboot doesn’t make it inherently bad, any more than calling it a ‘relaunch’ makes it less rebooty. It’s a semantic matter, at best.